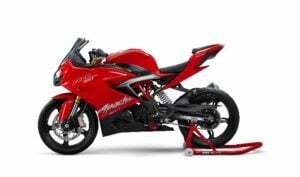 TVS Motor Company, a leading South India-based manufacturer of two-wheelers and three-wheelers, today announced the launch of TVS Apache RR 310. With the launch of the new Apache 310 model, TVS Motor Company finally gains entry into the 300cc sportsbike segment of our market. The RR 310 becomes the most powerful TVS motorcycle ever and its price range starts at Rs 2.05 lakh. 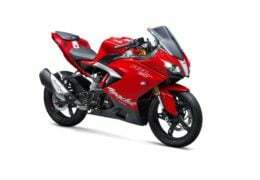 is now on sale with the TVS Apache RR 310 price range starting at Rs 2. 05 lakh (ex-showroom). The new model gets Anti-Lock Braking System (ABS), Upside Down Front Forks (USDs) and Electronic Fuel Injection (EFI) as standard. 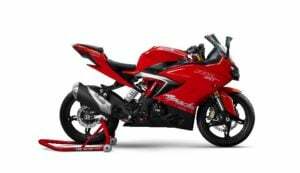 The new TVS Apache RR 310 price range starts at Rs 2.05 lakh. There will be multiple variants and a full price list should be out soon. ABS, EFI, USD front forks, Trellis Frame and Digital Speedo are standard features, thereby making the new model pretty good value for money. The new Apache RR 310 comes with a 312cc, single-cylinder, 4-stroke, 4-valve, liquid-cooled, fuel-injected engine that churns out a maximum power of 34 PS @ 9700 rpm and a peak torque of 27.3 Nm @ 7700 rpm. The engine is mated to a 6-speed super-slick gearbox. TVS Apache RR 310 is built around an all-new, race origin, light-weight trellis-frame chassis for enhanced stiffness in straights, and flex for dynamic cornering capability. The motorcycle uses a unique reverse inclined DOHC (double overhead cam) engine with LCOC (liquid-cooled oil coolant) technology. This facilitates a compact layout for an ideal power-to-weight ratio and better mass centralization. The Apache RR 310 will come with a modern engine that will be high on power. However, thanks to all the modern technology the motor will be able to deliver a mileage of at least 25 KMPL. It could even deliver up to 30 KMPL on the highway. We are pretty sure that this bike will offer a good mix of performance and mileage. The motorcycle boasts of a top speed of 160 kmph, and acceleration from 0-to-60 kmph in just 2.9 seconds, thanks to an advanced aerodynamics package that promises the lowest coefficient of drag in this segment. The new TVS Apache RR 310 doesn’t have the carbon fibre body that the Akula concept did. 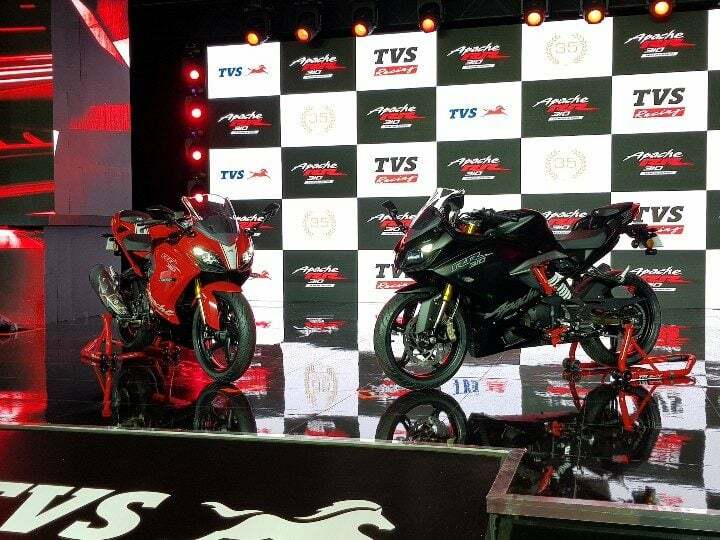 However, the upcoming TVS Apache 310 model still looks a lot like the concept motorcycle. Akin to the Akula, it looks very racy and very attractive. The Apache RR 310 gets a huge front-fairing, a huge windshield and a split headlamp setup. The headlamps hold HID projector setups, which further enhance the premiumness quotient of this bike. The LED DRLs further lend that touch of stylishness. Both the headlamps will be ON even on low beam.This motorcycle gets a cast alloy swingarm to improve handling. At the same time, we’re hoping the suspension to offer decent ride quality over most surfaces. The USD forks come painted in golden, which further make the bike look sportier. The bike’s ‘devil’s horn’ taillamp catches attention at the rear. The LED taillamp, along with the LED indicators, give a very premium look to the bike. The end can for the TVS Apache RR 310 comes from the BMW G310R. The raised clip-ons, along with the rear-set footpegs and split seats, make the bike more performance-focused. The bike will get sticky tyres from Michelin. Other highlights of the bike include split seats, a sculpted fuel tank, a digital speedo console and disc brakes at both the ends. The riding position is sporty yet ergonomically well-sorted. Also, the large bubble-type windshield will offer sufficient protection from the windblast. Finally, the projector headlamps should offer decent illumination in the dark. The motorcycle comes in 2 colours – Racing Red and Sinister Black. Stay tuned to CarBlogIndia for more on the new TVS Apache RR 310. Also, what’s your take on the new TVS Apache RR 310 price? Share your views with us by commenting below.